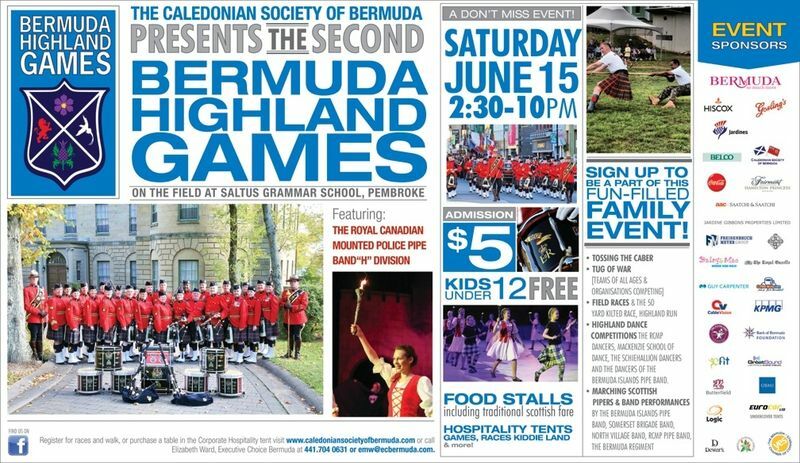 Come out to this fun-filled family event with the games including Tossing the Caber, field races, the 50 yard kilted running race, a 5K run and walk, children’s running race, Tug o’ War, Kiddie Land and more, with food stalls available on the grounds including traditional Scottish fare and Bermuda eats. The guest Pipe Band will be the Royal Canadian Mounted Police Pipe Band & Dancers and we will also welcome the Schiehallion (shay-hal-ee-on) Dancers from Ontario (who have featured in the Edinburgh Military Tattoo) as well as the MacKenzie Dancers from Nova Scotia. Admission is $5, free for children under 12 years. The day before the Highland Games, on Friday, June 14th, there will be a special Happy Hour followed by a Ceilidh at the Fairmont Hamilton Princess. Bacardi has been a longtime supporter of Caledonian Society events with Dewar’s products. To complement the Highland Games, Bacardi are bringing over Stephen Marshall, Global Brand Ambassador for John Dewar & Sons. Stephen will be doing whisky training and tasting sessions at various restaurant locations between June 11th and June 14th, an excellent opportunity to share in the knowledge from a renowned whisky expert, who is passionate about the industry.